As readers of The Collation know, the Folger welcomes scholars on fellowship, Folger Institute program participants, and individual readers to our reading rooms. But what our readers may not know is that each January, we open our doors to a special group of scholars, the Amherst-Folger Fellows. This group consists of Amherst College undergraduate students, carefully selected through an application and interview process. Earlier this January, while many of their classmates were still enjoying winter break, six students arrived for two weeks of guided research and exploration of their proposed research projects. 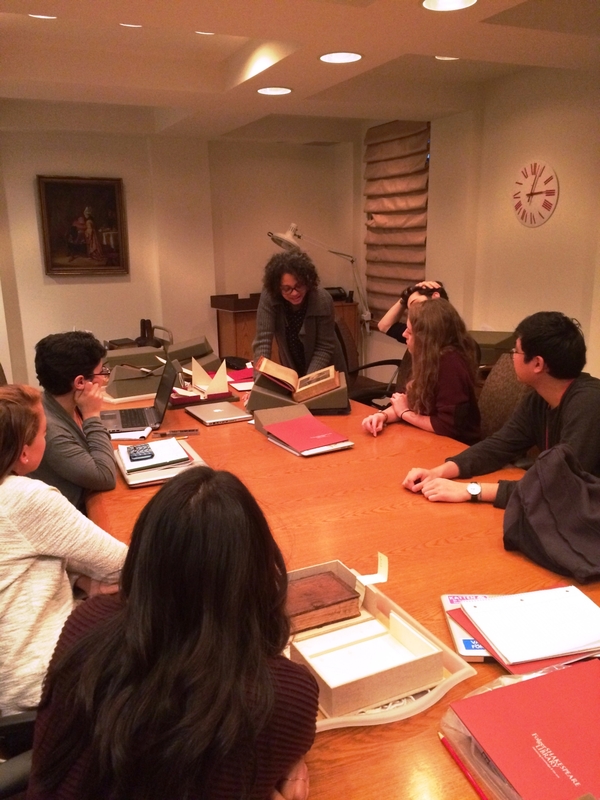 This year they convened under the broad rubric of “Media, Materiality, and Meaning” to advance their research questions while engaging with the types of evidence that can only be found in a collection like the Folger. The first week of our Amherst Fellows’ residency was filled with introductions, orientations, and discussions of set readings (of course, their first experience with the famed Folger tea!). They met curators, reference librarians, Institute officers, past fellows, and scholars-in-residence who introduced them to the methods that they used to crack open the riches of the archive. 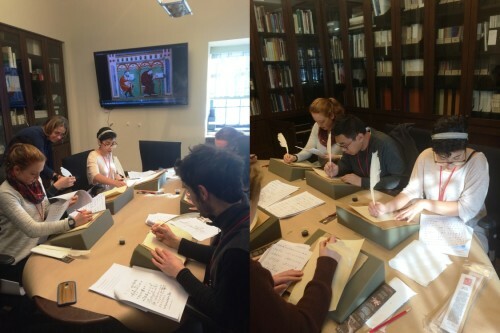 They unedited texts, learned the fundamentals of paleography (complete with quill and ink demo), and heard more about the collaborative digital initiatives underway at the Folger. Curator of Manuscripts, Heather Wolfe, works with the Amherst Fellows on the proper method to hold a quill. Practice makes fewer ink blots? Following this introduction, the second week was largely devoted to guided research on their individual topics. With the advice of their staff mentors, the Amherst Fellows framed (and reframed) their research projects and gathered materials that spoke to their interests. They considered myriad ways texts and artifacts are made, how they take different forms and formats throughout their existence, and the many audiences who have interpreted and preserved them for future generations of scholars. The Amherst Fellows also considered the various technologies that facilitate the production and preservation of material artifacts, and the challenges that remediation often brings to the relationship between text and interpreter. Amherst Fellow Emma Hartman holds ink balls, the likes of which would have been used to get ink onto printing presses. Crystal Park (Class of 2017) delivered “Roots of Imperialism in Costume in the Sixteenth and Seventeenth Centuries,” which compared the depictions of foreign and English dress in John Speed’s atlas, Theatrum imperii magnae Britanniae (1616), costume books like Cesare Vecellio’s Habiti antichi et moderni (1590, 1598), travel accounts like Nicolas de Nicolay’s Les quatres premiers livres des navigations et pérégrinations orientales (1567, 1576), and extra-illustrated alba amicorum. These media collected and “translated” the dress of non-Europeans and attempted to assert European cultural superiority through physiognomy and dress. Jacob Pagano (Class of 2018) presented “Shakespeare in China: Enchantment and Humanism during the New Culture Movement (1915-1921).” As guiding questions, he asked, “Why was Shakespeare translated, adapted, and disseminated at this period? How did his works influence Chinese philosophy, political thought, and the emergence of a national Chinese literature? What did he supply this cultural moment?” He discovered that Chinese intellectuals like Lu Xun readily adapted “Shakespeare” to scrutinize classical Chinese thought in the early years of the twentieth century while appropriating his emotive language and themes to present their vision for a society in transition. Kevin Mei (Class of 2016), in “The Falling Sickness and its Remedies,” explored the complex cultural history of epilepsy. Drawing on midwifery manuals, recipe books, anatomy textbooks, medicinal dispensatories, and case studies such as John Hall’s Select Observations on English Bodies (1657), he examined early modern explanations of the causes and cures for epilepsy, which often drew their logic from Galenic humoral theory and Paracelsian hermeticism and iatrochemistry. The use of human skulls and mummies in remedies for epilepsy was a complicated part of the history of cannibalism. Catherine “Cat” Lowdon (Class of 2017) focused on the English parlor to extend her work on the Rotherwas Room, an English wood paneled room transported from the Bodenham family estate in Herefordshire to Amherst, MA. Through the study of architectural treatises, plans, household inventories, and corpora searches for relevant key terms, she considered notions of privacy and compartmentalization as well as thinking about the activities that occurred in these multifunctional rooms. Her research discovered that parlors were often gendered spaces used by widows as bedchambers, but families with more status also used them to showcase their illustrious ancestry. Emma Hartman (Class of 2017) researched Alberto Sangorski’s manuscript of Shakespeare’s Songs and Sonnets (1926) to focus her exploration of fine art secular manuscript illumination for “Manuscript Illumination and the Art of the Book in Nineteenth- and Early Twentieth-Century England.” Using the Folger’s holdings on William Morris and the works produced by his Kelmscott Press (and later, by the Doves Press), she was able to track the medieval design sensibilities Morris and his followers discerned and tried to translate for modern aficionados: legibility, functionality, and aesthetics. Irisdelia Garcia (Class of 2018) presented “Focus, Virtuality, and Othello.” She drew on the scholarship of N. Katherine Hayles and Alan Galey to expand the notion of virtuality to all forms of potentially performative media, not simply digital ones. Her work with nineteenth-century prompt books, the Luminary application, and modern film versions led her to the realization that interactive, transmedial texts fundamentally change the focus and meaning—and thus the possible interpretations—that might be assigned to a text. We at the Folger wish them luck with their future research adventures! Owen Williams is Assistant Director for Scholarly Programs at the Folger Institute of the Folger Shakespeare Library. He welcomes some two hundred scholars to the Institute’s programs each year. He holds the A.B. in Classics, Greek, from Stanford University, the M.A. in English Literature from the University of Tulsa, and the Ph.D. in English from the University of Pennsylvania. Editor of Foliomania! Stories Behind Shakespeare’s Most Important Book (2011, reissued 2015), he is currently co-editing Periodization and “Early Modern” English Temporalities: Reimagining Chronology through 16th- and 17th-century Habits of Thought, with Kristen Poole for the University of Pennsylvania Press. His scholarly interests concern late-Elizabethan religious separatists.